Facebook Advertising for Car Dealers? Automotive Consumers Don’t Just Ignore Irrelevant Marketing Messages from Car Dealers… They Take Action! Almost all car buying consumers and service customers claim to have received information or promotions from a car dealer that were not relevant to them. This includes offers that show the dealer doesn’t know who they are (71%). Dealers are also guilty of sending mixed, or inconsistent information across different methods of communication (51%). Many times, the dealer’s messaging includes basic errors about the consumers’ identities (41%). A new Janrain and Blue Research report details out the data in newly-released survey results touting the benefits of social login. In response, more than 9 in 10 respondents have developed an unfavorable attitude to the dealership or taken some kind of action to limit the messaging. Never visited the website again (10%). Apparently, it only takes a couple of missteps to turn off a sizable proportion of automotive consumers: almost half said they automatically delete emails or categorize them as “junk” after being mis-targeted twice; 38% unsubscribe after receiving two mis-targeted emails. By delivering data that can be used by auto industry marketers to personalize their communications, social account profile and login based campaigns can avoid these pitfalls, per the researchers, who indicate that 9 in 10 respondents have encountered social login at some point and half use it. The primary reasons for consumers to use social logins being faster registration (65%) and one less password to remember (50%). That brings to mind a survey released early last year by Janrain and Harris Interactive, which found that 88% of online adults don’t like being asked to register on a website, with 51% of those turned off by the idea of having to remember another user name or password. Interestingly, though, social login use is currently not driven by a desire for more personalization; only 12% said they chose social login to “ensure websites are more personalized.” That either implies a lack of awareness of the benefit among consumers, or that they simply are not as enamored by website personalization as they say they are. Among those not using social login, half say a primary reason is a lack of trust in the company to use their data appropriately, with one-third concerned that the company will post to their feed, and 1 in 6 concerned that the company will spam them or their contacts. In a study released late last year by Forbes Insights and Turn, only 2% of B2C customers said they believe they benefit more than companies when sharing their data, and a majority indicated that their privacy concerns outweigh benefits from sharing information. Some reassurance would no doubt help: according to the Janrain study, respondents would be most likely to respond to reassurances that the dealership will not contact others in their social network… Sending advertising messages to a customer’s 300 Facebook Friends is not something that automotive consumers seem to warm up to. These same consumers also want to know that their information would only be used to personalize their experience. Sending free trials, gift cards or promotions won’t do the trick for many. Even with this rather broad view of “usefulness,” only a minority of respondents would allow mobile phone apps to offer special “Dealership Offers” (49%) or would like suggestions based on their social media account profile info (44%), among others. About the Data: The data is based on a national survey of 594 adults, most of whom (55%) fell into the 35-64 age range. via Automotive Digital Marketing Professional Community. The TrueCar AutoCon Scholarship Program is further evidence of the remarkable transformation that has taken place at TrueCar since the beginning of 2012. After receiving a remarkable level of criticism within the auto industry during the second half of 2011, TrueCar has evolved and revised their automotive purchasing programs for consumers and affiliated corporations to be far more dealer friendly. TrueCar’s objectives supported by these changes have included raising dealer profit margins to levels that provide more room for dealers to cover facility costs and the staffing levels needed to properly service new vehicle buyers sent to them by TrueCar. TrueCar understands and recognizes the need for ongoing training and thought leadership within the ranks of the retail automotive industry. Their management team has decided that one of the best ways to demonstrate this commitment to betterment of the industry is to commit the funds necessary to support independent dealer focused educational events such as AutoCon 2013. TrueCar executives Bernie Brenner and Mike Timmons approached the founders of the Automotive Digital Marketing and dealerElite professional communities, Ralph Paglia, Chris Saraceno and Mike Myers because these online networks have served as “Ground Zero” for some of the industry’s harshest criticism of TrueCar in the recent past. Surprising for a company as large as TrueCar is, their management team has reviewed the criticism published by members of the ADM and DealerELITE networks and taken corrective actions, changed their business models and worked with State dealer associations to create vehicle purchase programs that make sense for participating dealers. If you are better at explaining your reasons why you should be selected for a scholarship in a verbal manner, the AutoCon 2013 TrueCar scholarship committee will also be pleased to accept your proposal in a video format. Simply explain why you should be selected in a YouTube video that is either uploaded or embedded to either AutomotiveDigitalMarketing.com or dealerELITE.net. Please be sure to include the link to that video in your scholarship application where you write out your explanation of why YOU should be selected to receive a “Full Ride Scholarship”. Marketers on Twitter are warming to Vine, and it appears that consumers are too. TechCrunch recently pointed out that Vine climbed past Instagram on the Google Play charts to take the mantle as the top social application, and has also noted that Vine shares on Twitter have surpassed Instagram shares. Now, new data from Socialbakers indicates that tweets containing Vine uploads have a 0.031% engagement rate, not far behind tweeted YouTube videos’ rate of 0.048%. Socialbakers calls the results “surprising” and even “amazing” considering that Vine is so new – it was only just introduced to Android, having previously only been available to iPhone and iPad users. (The Socialbakers data is based only on iPhone and iPad engagement.) Now, Facebook isreportedly exploring video for Instagram. Branded content accounted for 4% of the top 100 Vines tracked, compared to only 1% of content in the Unruly Viral Video Chart Top 100 Most Shared Videos that was branded. About the Data: The Socialbakers data is based on an analysis of more than 30,000 tweets containing YouTube and Vine links posted over a 1-month period by selected brand profiles. The time period was May 5-June 5, 2013. Instagram Video Vs. Vine: What’s The Difference? Instagram vs. Vine: Which app does video better? Most people working in management position at dealerships and dealer groups have figured out that LinkedIn is a remarkably effective tool for networking with business owners and auto industry professionals that may be a good fit for open positions at your dealership. But what about using LinkedIn for marketing your dealership’s new and used vehicles, service department, parts and accessories? More and more automotive marketers are turning to LinkedIn to promote their dealership’s products, services, and published content. You and your car dealership have more power at your disposal with LinkedIn than you might realize. LinkedIn has a powerful advertising campaign creation and management platform. If you’re using Google Adwords or any PPC advertising to power your dealership’s presence on Facebook, Twitter and Google Search, consider adding LinkedIn to that list, too. If you’re new to the LinkedIn advertising app, you can reference thisADM blog post, which walks you through each of the app’s required steps to set up your dealership’s own user targeted LinkedIn advertising campaign. I also want to thank the great social marketing professionals at Hubspot for the primary substance of this post which was originally published on the Hubspot Blog by Amanda Sibley. Hubspot also offers a highly informative eBook which provides a great resource for the how’s and why’s of advertising on LinkedIn. I recommend that all ADM Professionals download this eBook, print it out and keep as a useful reference document. To start creating a LinkedIn ad campaign, go to https://www.linkedin.com/ads/. Once in the ads platform, select New Ad Campaign and Start New. You will want to choose a name for your ad campaign that ‘s unique and relates to the campaign you’re running, for easier identification if you start running multiple ad campaigns. By calling it “Test 1” I have no way of knowing who I am targeting by just looking at the name of the campaigns. You can now choose what language you want your ad to be in. LinkedIn will not translate your ad into other languages, but it can be written in any of the languages LinkedIn supports, including Spanish, French, and German. Next, choose between LinkedIn’s two media types, which include a basic text ad, and a video ad. Keep in mind videos must be 30 seconds or less. Now you’re ready to start writing the copy for your ad! First, decide where you want people to be directed after clicking on your ad. You can send people to a specific external web page, such as a landing page for an offer on your dealership’s website, or you can send them to a page on LinkedIn about your dealership, such as your business page or a group discussion about your dealership, specific models or events. Ad Headline: The headline of your ad cannot be more than 25 characters. Ad Body: The body of a LinkedIn ad can be up to 75 characters long. The copy of your ad should be relevant both to the person viewing the ad, and the offer or page to which you’re sending them. For best results, create a different ad for each buyer persona you have, and tweak the copy accordingly. For example, when promoting a book to college professors, putting the words “College Professor’s Guide to …” may generate a higher clickthrough rate (CTR) than generic, untargeted copy. I mean, that copy certainly wouldn’t perform as well if it was viewed by elementary school teachers, right? Call-to-Action (CTA): Having an actionable CTA within your ad copy will also help you improve your ad’s clickthrough rate. Tell people to “Download your ebook now!” or “Click now for free samples!” instead of writing compelling ad copy (great!) devoid of actionable copy that tells the reader what to do next (not so great). Value: Incorporate your value proposition into your ad copy, making people more likely to click on your offer. If you tell them, “20% off your first purchase,” or “Clearance sale ends today, shop now!” you’re letting people know what specifically they can gain from clicking on your ad right now. Don’t be afraid to test our your ad copy, either. You can create up to 15 variations of your ad in each campaign, and all variations of your ads within one campaign will be seen by the same people. These variations allow you to test different images and copy within your ads to find what works best for your audience. Targeting who sees your ad to a very specific and relevant group of LinkedIn users can help increase conversions — more relevant, more clicks. LinkedIn lets you target by location, company, job title, school, skills, group, gender, and age. Location: You must select as least one location for your ads. Depending on your dealership’s franchises, more specific targeting may be helpful. You can select a location as broad as North America, and as specific as the San Francisco Bay Area. So if you’re trying to grow used vehicle sales in Hartford Connecticut, showing your ad to people in Los Angeles, California would be a waste of money. You can also take advantage of this targeting option to conquest sales outside of your traditional markets close to the dealership. You can also tailor your ad copy to specific locations. For instance, Ford dealerships may do well advertising specialty vehicles such as a Shelby GT500 Cobra Mustang to the entire Northeastern part of the United States, but should create ads that seek to sell the more commonly available Fusion to LinkedIn users in their local metro market. Company: If your target audience works at a specific company, you’re able to target them directly — even by name. You don’t need to have specific names in mind, though; LinkedIn allows you to also target companies based on categories, like Legal, Non-Profit, or Finance. Job Title: If your model line being promoted or service department offers are best for Presidents, VP’s, General Managers and CFOs, targeting only people that have “CFO”, “President”, etc. in their title will increase your conversions, and ultimately save money for your advertising budget. You can choose specific job titles, or chose from job functions and seniority. From the CEO of manufacturing companies, to the entry level associates at an accounting firm, you can target a specific group of people for your LinkedIn ads. School: If you are looking to target people who have a particular educational background, you can target your ads based on schools. If you know a lot of your prospects and customers come from a certain school, try reaching out to them through LinkedIn ads. Skills: Your target audience may have a certain skill set — email marketing, financial planning, risk management — think about what your target audience is good at, and try targeting people on LinkedIn with similar skills. Group: One of LinkedIn’s best attributes is the groups that like-minded professionals join to discuss industry trends and topics. If your audience is very vocal on a topic, or you’re trying to gain thought leadership in a certain area, this advertising type may be a good option for you. Gender and Age: If your audience is heavily skewed toward one gender and/or age group, target your advertising toward them. After selecting your targeting options, you can set up the payment method that works best for you. The two options you have for any pay-per-click advertising are 1) cost per click (CPC), or 2) pay per 1,000 impressions (CPM). If you pay per click, you will be charged each time someone clicks on your ad. LinkedIn will suggest a bid range depending on your budget and the competition for your ads; the more advertisers bidding on a similar campaign, the higher your bid will need to be. This bid is the maximum you will be charged. If the current rate is lower than your max bid, you will only be charged the current rate. If you choose to pay per thousand impressions, you will be charged a certain amount each time your ad is shown to one thousand people on LinkedIn. Deciding what form of payment to use and the best maximum bid can be tricky. When deciding between CPC and CPM, think first about your end goal. Are you trying to get as many people as possible to see your ad to help with, say, a branding campaign? If so, CPM may be the way to go. If you’re trying to get more people to click on your ads to drive traffic to your website, or generate new leads, CPC may be better for you. When thinking about an optimal maximum bid, some trial and error is needed. LinkedIn will give you a suggested bid, which is a good place to start. Then, think about when your audience is most likely online. You may want to bid higher during this time to be sure that your ads are the ones being seen. There are also certain times of day, and days of the week, that have a higher average bid based on usage and industry. Play around with your bids and see when you get the most return for your dollars spent. Set a daily budget for what works best for your company’s marketing budget. Before putting a lot of money into one campaign, first test out the success of each campaign and ad variation — you don’t want to put $1,000 into an ad that ends up not resonating with your target audience. Let’s say you’re the VP of Marketing at floral shop. You assume the majority of your target market is brides, so you direct your ads on LinkedIn to bridal groups. After spending thousands of dollars, you only generated 10% of the leads you were hoping for. After doing some research, you found that the people near your store and on LinkedIn are actually looking for flowers for corporate events. Wouldn’t it have been nice to know that before spending a large amount of your budget on LinkedIn ads? LinkedIn ads can be really successful for targeting niche markets. Because of their extensive targeting opportunities, almost any industry can find success on LinkedIn. Don’t be afraird to test things out. If something is going well, put a larger budget toward it, and watch the leads come in! LinkedIn now provides you with the option to collect leads on your behalf. This new feature allows people to ask for more information or to be contacted by your company via a checkbox at the end of your ad. You will be notified by email when someone has asked for more information, allowing you to promptly respond and hopefully turn those leads into customers. Keep in mind, however, that the only way you can contact them is via LinkedIn InMail; you will not receive an email address or phone number with which to contact this person. Finally, you can choose if you want your campaign to be shown continuously, or until a certain date. Now you’re ready to start your first LinkedIn ad campaign! You can track your progress in the LinkedIn ads platform home screen. Here you will be able to see a graph mapping your clicks, spend, CTR, and more over set periods of time. You can also see statistics and average CPC for each campaign to make educated decisions as to how to optimize each campaign. For all PPC ads, the CTR will be a very small number. On LinkedIn, a good benchmark for a CTR is around .03% or higher. If you have campaigns that are under-performing, there are several things you can do to optimize them. 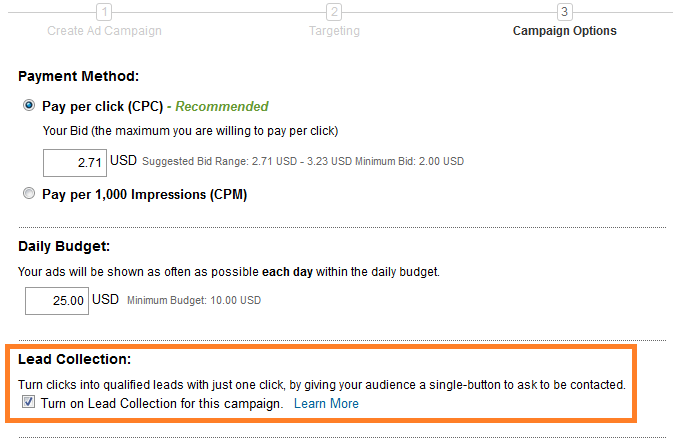 First, click into the campaign you want to look at so you can drill down into data on only one campaign. All ad variations of this campaign will appear, with separate data. Look at the CTR of each ad. Is one variation performing better than another? If so, you may want to pause the less successful campaign. LinkedIn will begin to show your less successful campaigns less frequently, so putting more resources into your most successful ad variations and campaigns will help you reach your marketing goals. Now that you have LinkedIn ads running that people are clicking on, it’s time to determine whether they’re actually driving qualified traffic to your website. That isn’t something LinkedIn can tell you — you need to do some closed-loop reporting on these campaigns to see who this traffic really “is.” After someone clicks on your ad and lands on your site’s web page, put the content you are offering behind a form. On this form, ask people important questions that help you qualify them as a good lead or not. This lead capture form should be connected to your customer relationship management (CRM) software so that once the lead’s information is in your CRM, your sales team can act upon these leads, and hopefully turn them into customers! After launching several ad campaigns on LinkedIn, look at the landing page form data in your CRM. Is the traffic to your website generated by LinkedIn ads qualified? Is it generating customers? If not, you may want to optimize your campaigns. For instance, if your LinkedIn ads are targeting people in companies sized 1-10, but you find that the majority of the closed deals in your company are from leads with company sized 100-200, stop targeting those smaller companies on LinkedIn! Because of awesome targeting capabilities on LinkedIn, you can target companies that have 100-200 employees, which may increase the number of closed sales from your LinkedIn ads campaign. Will Car Dealers Leverage Social Media Advertising for Competitive Advantage in 2013? How does LinkedIn Help Businesses? 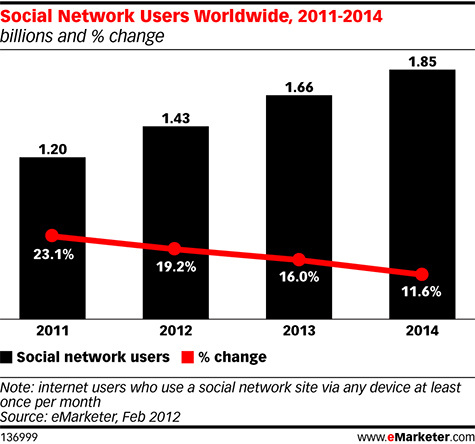 In 2012, more than 1.4 billion people around the world used social networks, up 19% from 2011. 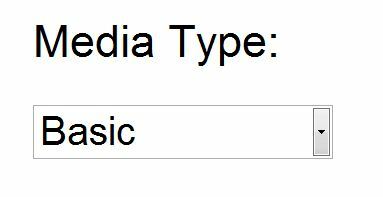 But although the worldwide social network audience is enormous, it is by no means unified. Within the North American automotive marketing landscape social media based advertising continues to mature and develop capabilities that are simply unavailable in other media channels. As social networking giants such as Facebook, LinkedIn, Twitter, YouTube, Google+ and others grow and develop increased business engagement models, their ability to attract marketing and advertising investments from the automotive industry grows. The chart shown below shows five years of social media based advertising spend with fairly steady growth. I predict a faster rate of growth going into 2014 as the targeting, messaging and creative engagement models provided by social networks continue rapid development and increased effectiveness in achieving automotive marketing objectives. ADM Professional Community members have access to all the data and insights we publish about social media. You can learn more about social network usage around the world below, but you can learn a lot more by visiting the ADM Professional Community daily. Complete the “Sign Up” form on the upper right of every ADM page to submit a membership application and start the conversation with experienced automotive marketers and people selling more cars using strategies and their tactics within the social media universe. Usage patterns are highly developed and predictable in some regions, and unstable and changing rapidly in others. And while many people use Facebook, not all social network users do. Facebook has shown many users how to get their most satisfying results from time spent online, this has driven an increased familiarity with online social media in general, and a cottage industry of social networks specializing in specific subject matters. Homegrown social networks, especially those seeking consumers, enthusiasts and influencers in automotive niches will play a larger role over time in most major markets in both the USA and Canada. Countries such as India and Indonesia are rapidly becoming major usage centers for social networking, particularly via mobile phones, and will each see their user bases grow more than 50% in 2012. This phenomenon, combined with Facebook’s staggering growth in the region, mean that in 2012, the Asia-Pacific region will, for the first time, be home to more Facebook users than North America is. As North American automotive consumers have become more accustomed and skilled at using social networks via their introduction through Facebook, many of them have ventured outside of the social media behemoth to participate in User Generated Content (UGC) sites, specialized blogs and forums, as well as other networks. In more mature markets like the USA and Canada, automotive marketers are looking to use the social media presences they have already established to deliver relevant content to fans. Social networks are making it easier for businesses, especially car dealers to broadcast changing incentives and promotional offers that create the deals which drive both sales and service recommendations across a wider network of users in real time with improved location and mobile targeting. With Facebook’s New Ads Manager and the growing maturation of the platform comes an increasing effectiveness for their paid advertising models. This in turn enables car dealers to leverage user profile based targeting that delivers the right message to the right automotive consumer at the exact right time. More and more North American car dealers are using the growing platform maturity and advertiser responsiveness at Facebook for a competitive advantage over their neighboring dealership competition which has ignored Facebook’s emerging capabilities. Half of American Car Buyers Engage with Companies on Social Networks – What about Dealers and their Employees?